Our cryogen specific hair laser system is state-of-the-art laser technology for hair removal. At present this is the only hair removal laser machine that cools the skin with cryogen, precisely before each pulse. This treatment targets the pigment in the hair and not the surrounding tissue, making it safe to use on almost all skin types. The aim is to destroy the hair follicle of actively growing hair; therefore a course of treatments is needed. You should also avoid sun exposure and the application of selftan lotion for six weeks before and after treatment. 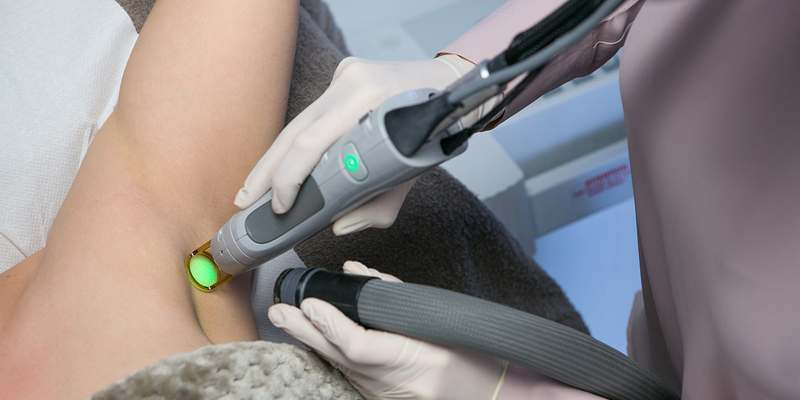 Sun exposure makes laser hair removal less effective and makes complications after treatment more likely. It is extremely effective at inducing permanent reduction of hair, have large spot sizes and high repetition rates for ultra-fast, high speed laser hair removal. Most importantly, the treatment is very comfortable. The comfort comes from the use of a high tech cryogen freezing spray which is emitted from the laser hand piece just prior to the laser beam. The cryogen spray anesthetises or “numbs – freezes the skin so the laser beam, which fires a few milliseconds after the spray. Topical anaesthetic cream is also applied prior to the treatment and the laser also comes with a skin air cooler for additional comfort if needed. It is advised that patients with photo-sensitive epilepsy not have the procedure done.